1.e4 e5 2.d4 others - Chess Gambits- Harking back to the 19th century! White can get into the Danish, Göring, Scotch and Urusov Gambits via 1.e4 e5 2.d4, and it is theoretically best for Black to comply, but in practice he or she sometimes does not. This move-order is a way of trying to reach a Scotch Game, Scotch Gambit or Göring Gambit, while avoiding the Petroff Defence (1.e4 e5 2.Nf3 Nf6) and the Elephant (2...d5) and Latvian (2...f5) gambits. The most challenging response is 3...Bb4+, whereupon after 4.Bd2 or 4.Nbd2, Black has a choice between trying to hold onto the extra pawn with ...c7-c5, or letting White regain the pawn on d4 and achieving equality. It is probably best to freely sacrifice the pawn with 4.c3 dxc3 5.Nxc3, whereupon Black's best is probably the straight transposition into the Göring Gambit with 5...Nc6 (reaching a position that more often arises from 1.e4 e5 2.Nf3 Nc6 3.d4 exd4 4.c3 dxc3 5.Nxc3 Bb4). 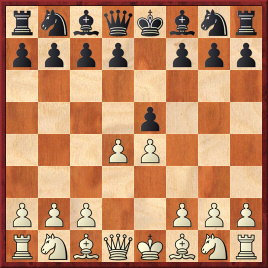 Thus, I don't think this move-order is a good way of trying to reach the Scotch Game, but if White wants to get a Scotch Gambit or Göring Gambit and is happy to play a Göring with Nxc3 and ...Bb4, then it is certainly worth considering. 3...c5 is better than it looks, but it creates a hole on d5 which White can exploit with 4.Bc4 with c2-c3 to follow, or 4.c3 immediately. 3...Bc5 can also be met by 4.Bc4 (which will usually transpose into a Scotch Gambit and then a Giuoco Piano) or 4.c3, but I cannot recommend 4.Nxd4 because 4...Nf6 then gives Black an improved version of the standard Scotch Game. 3...Nf6 can lead to a line of the "Old Petroff" after 4.e5, but in my own games I have invariably preferred 4.Bc4! ?, which leads to the Urusov Gambit. 3...d6 transposes into a line of the Philidor Defence (1.e4 e5 2.Nf3 d6 3.d4 exd4). White's main options are then an aggressive approach with Bf4, Qd2 and 0-0-0, and an alternative with Bc4 and 0-0 (which quite often arises from the Urusov Gambit as well). Finally there is 3...d5, which does not equalise because of 4.Qxd4!, threatening to win the pawn on d5. This is a way of reaching a Scotch Gambit after 3...Nc6 4.Nf3, or a Urusov Gambit after 3...Nf6 4.Nf3. White generally can't play c2-c3 without playing Nf3 first in this variation, because White lacks control over the e5-square and thus c2-c3 is generally met by ...Ng8-f6. White's best after 3...d6, 3...Bc5 and 3...c5 is also 4.Nf3. 3...Bb4+ is again likely to lead to a Göring Gambit after 4.c3 dxc3 5.Nxc3, whereupon ...Nc6 and Nf3 generally follow. In some variations White can also consider developing the g1-knight to e2, to support the knight on c3, but I don't think that the line 5...Nc6 6.Nge2 is direct enough to provide White with enough compensation for the pawn. 3...d5 again fails to equalise here- after simply 4.exd5, Black is in danger of going a pawn behind. Black might prefer the idea of trying to retain the strong-point on e5, but one advantage of the move-order with 1.e4 e5 2.d4 is that Black has no particularly good way of doing so. The most reliable way may be 2...Nc6 (transposing to a line of the Nimzowitsch Defence), transposing to a line often used by Tony Miles, which gives White just a small advantage after 3.dxe5 or 3.d5. White can also transpose into the Scotch Opening with 3.Nf3, after which Black's best is 3...exd4, since 3...d6 leads to a good game for White after 4.Bb5 (transposing into the passive Steinitz Defence to the Ruy Lopez, 1.e4 e5 2.Nf3 Nc6 3.Bb5 d6 4.d4) or 4.dxe5. 2...d6 is also playable, whereupon White can choose between 3.dxe5 dxe5 4.Qxd8+, or 3.Nf3 transposing to Philidor's Defence. Black's best after 3.Nf3 is probably 3...exd4, since 3...f5 4.Bc4 is dubious for Black and 3...Nf6 is met by 4.dxe5 Nxe4 5.Qd5 (this line is the reason why most grandmasters prefer to head for the Philidor via 1.e4 d6 2.d4 Nf6 3.Nc3 e5). 2...f6 is dubious, since after 3.dxe5 fxe5?? White wins straightaway with 4.Qh5+. Instead Black's best is 3...Nc6, heading into the Soller Gambit (a sideline of the Englund Gambit, 1.d4 e5 2.dxe5 f6 3.e4 Nc6), which should not be underestimated, but White can probably get an advantage somewhere between "+=" and "+/-" with either 4.exf6 or 4.Nf3. 4.Nf3 is probably the most reliable option, allowing Black to regain the pawn but preparing Bc4 and Ng5, taking advantage of Black's weakened kingside. 2...Nf6 is also dubious due to 3.dxe5 Nxe4 4.Bc4, threatening Bxf7+, and White can also consider 4.Qd5.